So this week has been exciting and brain-numbing and stressful, all at once. I was rejected by the only job I had left in the pipeline (I'm considering totting up my rejections because I'm part-curious, part-sadistic), turned 23, entered into my first of three weeks of a temping contract, and confirmed a two week internship at a dreamy publication. Oh, and I handed in my housing notice. Because that is how much I'm struggling. It's quite literally the last thing I wanted to do. I love where I live, and my housemates, and being independent and doing my own thing at all hours of the day. It's gutting. But I have to draw the line somewhere - my savings are dwindling faster than I care to think about. With all this in mind, I thought I'd do a little post about my favourite things right now, to take my mind off more stressful things. Cus she's got that red lip, classic, thing that I like... I love everything about this video. Taylor is flawless, as per, and her lipstick gives me major lip envy (if that's even a thing. Is it?). It's a perfectly dreamy portrayal of heartbreak and has all those metaphors of waves (pain of break-up) and fragmented mirrors (memories, reflection of break-up). So the video makes both the English lit geek and aesthete in me very very happy. And I would love to know what lipstick/lip liner combo she's rocking. This kind of shouldn't count as a favourite thing because I haven't got an SD card at the time of writing (yep, in the excitement of purchasing the camera and an iPad adaptor, I didn't ask for one, and John Lewis didn't offer one. Awks) but I kind of don't care. It's more about what it means for me. Finally, guys, no more blurry, out of focus images! The dream is happening. I can't wait to play with all the settings then give up and just stick to auto like hey, I tried. Or maybe this is the start of an impressive photography career. Who knows? Well, if I don't believe in this, I can't believe in anything, can I? With yet another job rejection, and an interview I'm still in the dark about, there's not much on the permanent job horizon. I'm currently temping at a company, answering customer service emails and eating small nibbles (okay, chunky Sainsburys cookies and big buttons) to keep me going. Luckily I'm with a group of girls - albeit in a small, warm room - so we can ask each other for help and share sweets and gossip. We'll probably all leave a stone heavier, but beggars can't be choosers. Did I mention it was my birthday this week? Ha. After a pre-birthday breakdown (soothed by my lovely housemate, so all was well on the actual day), I decided to just treat it as a normal day with a few lovely treats thrown in. Lush. It was a low key affair, as I decided to head to my Dad's house in North London for pancakes so I could be with the whole family, and take a few snaps with my stunning sisters. The latter wasn't planned, obviously. I'm also having an old school sleepover with friends, junk food and wine this weekend to catch up with everyone which I'm thoroughly looking forward to! 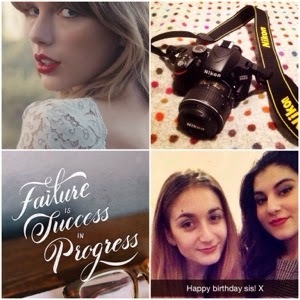 Image created on Instagram, using a mix of personal photos and images from We Heart It.